I missed your first talk. I left for office when you first walk. I couldn’t be with you, first day at school. I know your dad isn’t that cool. I was on the way home, when you got injured. I was really scared when I heard. I cancelled our plan for the sunset. I know I owe you my time as a debt. I wish for a life to live those lost moments. More than you, I regret my absence. I was out there to make your future bright. I want your days ahead to be filled with light. Coz I’ve been in the darkness and blues. I'd never want you to walk a mile in my shoes. 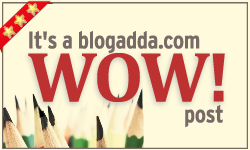 This post is a part of Write Overthe Weekend, an initiative for IndianBloggers by BlogAdda.